Sulphation roasting offers the potential to simultaneously extract valuable metals from multi-metal sulphide minerals. 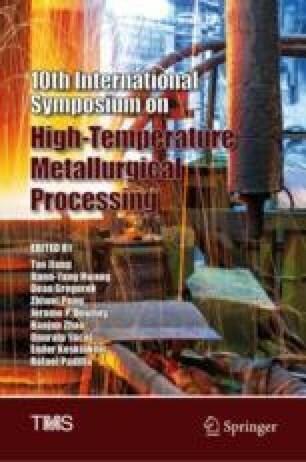 In this study, the influences of roasting temperature and sodium sulphate addition on the sulphation of valuable metals were investigated under isothermal condition in a static air atmosphere. Additionally, the reaction mechanism during sulphation roasting process was characterized by thermogravimetry and differential scanning calorimetry (TG-DSC), X-ray diffraction (XRD) and scanning electronic microscopy (SEM). The results show that the optimum sulphation roasting temperature range is 600–700 °C. The leach extraction efficiencies of Ni, Co and Cu exceeded 60% when about 10 wt% sodium sulphate was added during roasting. The role of sodium sulphate as a sulphation promoter is attributed to an intermediate phase that acts as a reservoir of SO2. This work is financially supported by Steel Joint Research Foundation of National Natural Science Foundation of China–China Baowu Iron and Steel Group Co. Ltd. (Grant No. U1860203), National Natural Science Foundation of China (Grant No. 51576164) and the CAS Interdisciplinary Innovation Team.